So what do you do when you have too much leftover pasta? Fried pasta! Fried noodle cakes are popular in a number of cuisines, particularly in Asian cooking. When cooked pasta is fried it becomes crisp and toothsome. 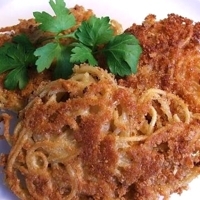 Asian noodle cakes typically don’t use a binder; in this Italian-inspired recipe a bit of breadcrumbs, a beaten egg and parmesan cheese is added to cold leftover cooked pasta. Exact proportions are not important and the pasta can be fried in smaller cakes or one large cake the size of your frying pan. Add-ins are also optional but herbs, a bit of leftover cooked, chopped meat or other types of grated cheese all produce interesting results. Here I’ve used leftover pasta from my prior recipe, Pasta with Garlic Breadcrumbs (http://lasvegasfoodadventures.wordpress.com/2010/02/11/fried-pasta/) but any plain, cold, cooked pasta is perfect. Preheat a few tablespoons of oil in a non-stick saute pan over medium heat. While the pan is getting hot combine the remaining ingredients in a bowl. When the pan is hot add the pasta to the pan in the size desired, flattening slightly, and fry on both sides till golden brown. Serve plain, with pasta sauce or extra cheese. wow this sounds great my family will love this! Sounds yummy! Too bad we NEVER have leftover pasta... lol! This dish is good for breakfast, lunch, or dinner!